The Young Master (Chinese: 師弟出馬) is a 1980 Hong Kong martial arts action film directed by and starring Jackie Chan as Dragon. 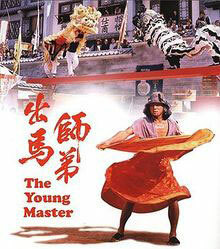 The Young Master is notable for being the first that Jackie Chan worked on for Golden Harvest, and despite being his second film as director (his first was The Fearless Hyena), this is often incorrectly credited as his directorial debut. It was co-written by Chan and King Sang Tang and produced by Raymond Chow and Leonard Ho. As is common with Jackie Chan‘s films, the fight scenes involve the use of many different weapons including poles, a rope, fans, benches and swords. Dragon Lord is supposedly the sequel to The Young Master and was even originally called Young Master in Love, as confirmed by Jackie Chan in his book. The film was the highest box office draw of its day beating previous box office records set by Bruce Lee and establishing Chan as a Hong Kong cinema’s top star. The fan-fighting scene in this movie required 329 takes to complete due to the intricate choreography. The climactic showdown between real life Chan and hapkido master Hwang In-Shik in the original release of this film was approximately 15 minutes long, reputedly the longest fight scene in any kung-fu movie to that date. Subsequent releases of the film have edited this scene down for time. The school attended by Dragon (Jackie Chan) and his brother, Tiger (Wei Pei) is entered against a rival school in a Lion Dance competition. The school needs to win the prize money to remain open but their star performer, Tiger, is seemingly injured when he falls from a ladder, leaving his brother, Dragon, to take his place. During the competition, Dragon realizes that his brother feigned his accident in order to take part in the competition for the rival school. The rival school wins the competition, but the truth emerges about Tiger‘s betrayal and he is exiled in disgrace. Dragon vows to bring back his errant brother so the pair can make amends to their master. Dragon sets off on his mission, but en route is mistaken for a criminal known as The White Fan by local police chief, Sang Kung (played by Shih Kien). Meanwhile, Tiger collaborates with his employers (the rival school) by freeing a dangerous criminal known as Kam (Hwang In-Sik). However, Tiger is later framed for a bank robbery. To stop his brother from being arrested, Dragon promises to apprehend the escapee, Kam. Jackie Chan: He’s Superman To Kungfu Movies! I Meant a STANDARD Perm! Posted on 17/03/2012, in Movie, video and tagged Film, full, Jackie Chan, Kung Fu, Tiger, Young. Bookmark the permalink. 6 Comments. I am honored to be one of the readers of this blog post. Thanks to your generous support I am really the first in my house to have some knowledge about this topic. Growing up in a very less privileged community has not only provided challenges of internet access, but it has most importantly made me realize the real value of being blessed with all the wealth of information on your web blog.